Arcade Fire are still in the midst of the promotional run behind last year's divisive Everything Now, but they took a bit of a detour down memory lane last night (September 20). Taking the stage in Los Angeles, the band ran through their 2004 debut album Funeral from start to finish. 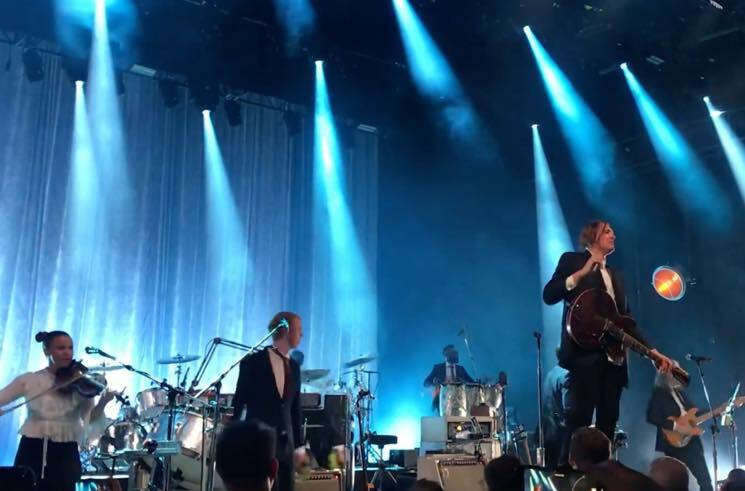 According to fan site Arcade Fire Tube, frontman Win Butler told the crowd at the Greek Theatre, "We're not sentimental, but it's just been 14 years since Funeral so we felt like playing it." Arcade Fire Tube also claims that the group will be doing the same for their show at the Greek Theatre in Berkeley, CA this evening, as well as tomorrow. Following the 10-song Funeral set, the band delivered 13 more songs spanning their subsequent albums. Check out some video footage from last night's performance of Funeral below.